Have you been avoiding the dentist due to fear or anxiety problems? Are you looking for a more patient-centered practice where your needs are put first? If you are craving that personalized and gentle professional dental care, then look no further! At Tarpon Dental, Dr. Seema Amin and her team, work hard to deliver the highest quality of dental care from the moment you walk in, while putting you and your family’s needs above all else. “Our main goal is to help patients achieve the smile they want and keep their overall oral health in optimal condition,” says Dr. Amin. Dr. Seema Amin prides herself in providing personalized care for all patients. With a well-established background in the field, she can administer specialized treatments in all aspects of dentistry. She also treats all patients in a caring manner and provides a comfortable over-all dental experience. 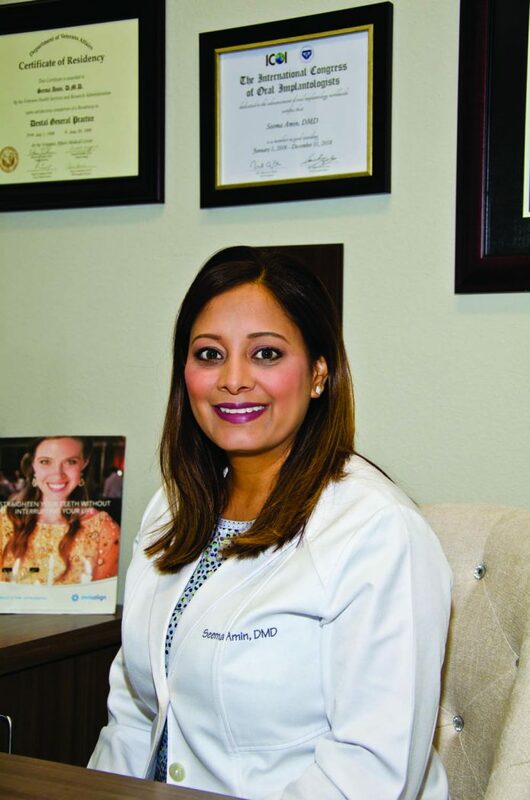 After 13 years as an associate dentist in a private practice, Dr. Amin decided it was time to branch out and start her own practice close to home. In 2011, Dr. Amin took over Tarpon Dental and continued to grow that practice by going the extra mile for each of her patients, until August 2017, when she decided to expand and build a brand new facility. Conveniently located in Tarpon Springs at 2611 Keystone Road in the Cypress Turn Center, the new state-of-the-art facility was built with patients in mind. From the warm, inviting waiting room to the relaxing treatment rooms, you’ll feel instantly at ease when you come to Tarpon Dental. If you have to have a longer procedure performed, there is a private VIP suite with a heated, massage chair where you can relax, and even watch a movie if you’d like. To help make regular cleanings more enjoyable, the hygienists at Tarpon Dental value your time and make your visit as comfortable as possible, and also use digital x-rays to help you avoid unnecessary radiation. “Dr. Amin and her entire staff are knowledgeable, caring, kind and compassionate. Their genuine concern for me and my needs as an individual is only surpassed by their professionalism and desire to impart the most current information from research related to the health of their patients and the use of state-of-the-art technology to promote oral health and well-being,” said patient Junetta S.
Originally from London, England, Dr. Seema Amin moved to Florida with her family when she was 12 years old. After college she and her husband lived up North for a few years before deciding to return to Florida. She is thrilled to be able to help people in her community through Tarpon Dental and volunteers at Gulf Coast Outreach. Dr. Amin received her Doctor of Dental Medicine degree from the University of Florida. She is a Fellow in the International Congress of Oral Implantologists, an honor only a small percentage of dentists achieve. If you’ve been avoiding the dentist for a while or have been looking for a new patient-focused practice, make an appointment with Tarpon Dental today. They accept many dental insurance plans and are happy to answer any questions about benefits or the practice when you call. You can even schedule a time to take a tour of their brand-new facilities. Tarpon Dental is located at 2611 Keystone Road, Suite B-7 in Tarpon Springs. Their office is open Monday through Friday. For more information, please visit www.TarponDental.com. To schedule an appointment, call (727) 937-4285. Previous articleMystic Fish Seafood Grill and Bar, a true neighborhood gem!